I just can not resist this ocean blue! Eclectic Kitchen by Portland Interior Designers & Decorators Garrison Hullinger Interior Design Inc. 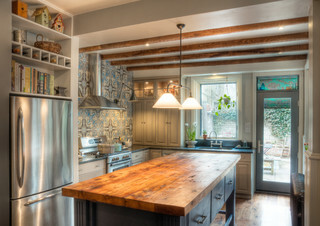 This is, again, from Houzz.com. 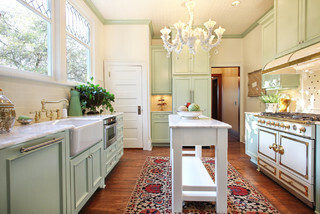 I have been learning so much from Houzz.com on many types of remodeling projects. Can’t wait to actually start my own remodeling! Of course I won’t have enough return on a $70,000 kitchen remodeling (until I buy a multi-million villa, huh?) but I think it is reasonable to paint the cabinets and change the faucet and sink, as well as backsplash, right? Are you planning on opening up to another room and you aren’t sure if you have a load-bearing wall? This might require structural work and unforeseen costs. Budget, plan, find a good pro and work with them – there are much to learn! ← Custom Media Wall for less than $2,000!